To achieve the greatest impact in mobilising support for its outcomes, EUthyroid presented a declaration to call on policy makers, public health officials, scientists and the general public to join forces to ensure that IDD prevention strategies are implemented across Europe to reach and secure a sufficient iodine status. The meeting to present the Krakow Declaration Meeting on iodine was held on Wednesday 18th April, 2018 at the Collegium Medicum / Collegium Novodvorscianum, Jagiellonian University, Poland. The Meeting was officially opened by Tomasz Grodzicki – Prof. Tomasz Grodzicki, Vice-Rector of the Jagiellonian University for the Medical College. The coordinator of the EU-funded project EUthyroid, Prof. Henry Völzke (University Medicine Greifswald), together with colleagues Prof. Alicja Hubalewska-Dydejczyk (Jagiellonian University, JUMC) and Prof. John Lazarus (Iodine Global Network, IGN) introduced the Declaration and laid out the clear actions needed to prevent the lifelong and debilitating effects of IDD. 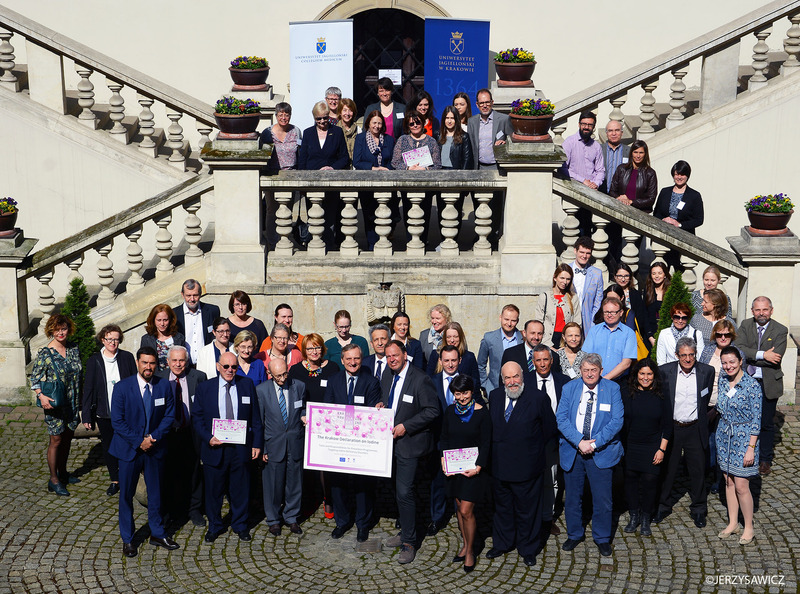 The presentation of the Krakow Declaration on Iodine is a historic moment, in that it is the first time that a pan-European call to action, from the 31 EUthyroid partners representing 27 countries, has been made. It was a particular honour for us that Zbigniew Krol, vice-Minister of Health in Poland was able to attend the meeting and lend us his support from the political sphere; acknowledging the importance of good science, the need for monitoring and the value that is placed on these items in Poland. Following the endorsement of the Declaration by external supporters a press conference was held attracting journalists from Polish national tv and major newspapers. At the time of its official launch to the public the Declaration website had already received signatures of endorsement from 20 organisations and 61 individuals showing the level of support and need for such an action to pave the way towards the eradication of iodine deficiency. To close the meeting Prof. Maciej Małecki, Dean of the Faculty of Medicine at the Jagiellonian University expressed his thanks for being able to hold this historic meeting in Krakow and offered his support for the Declaration.